The 8 gauge, 2″ square, welded steel wire mesh yields higher security, greater efficiency and ultimate value for your company. Permits fast and easy installation of wire partitions. 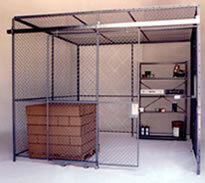 The convenience and cost saving benefits of this new design will revolutionize the woven wire partition industry. 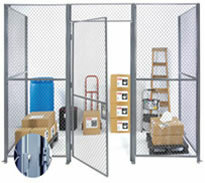 Boltless wire partition system is designed to be the most economical and secure system in the industry. Installation is faster with hook and fastener system. 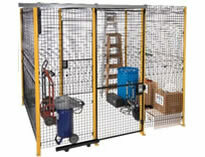 Bolted wire partitions are designed as modular sections, and are easily installed by one person with common hand tools using the included nuts and bolts.